Happy Again at Last: Life in the Art World is a collection of thirty stories set in various corners of the art world. These short fictions speak of the nature of the artist and the creative impulse, the artist's experience in the world, and the various issues, psychological and intellectual, that are integral to that experience and to the art world itself. The stories are wide-ranging, some of them darkly serious, others lightly amusing. This altogether unique collection is fully accessible to general readers and provides colorful insight into a world that in popular perception is often considered remote and mysterious. Robert McGowan was born in 1947 in Nashville, Tennessee. He served, reluctantly, as a pay disbursement specialist with the 9th Infantry Division in Vietnam, 1968/69. He has degrees (BS, MFA, MLS) in philosophy/biology, fine art (Cranbrook Academy of Art), and information science respectively and has been a university faculty member, library arts specialist, founder of arts organizations and publications (Turner Clark Gallery, Memphis Center for Contemporary Art, the journal Number:, Tennessee New Art Association), gallery director, newspaper art critic, book reviewer, a bookstore marketing and media relations manager, and is a widely published writer of fiction and nonfiction. He was for many years primarily a practicing artist and as such developed a substantial bibliography and exhibitions list. His work is in numerous private, corporate, and public collections internationally, including Bank of America, Bank of Korea, Cranbrook Art Museum, and the Smithsonian American Art Museum (SAAM), Smithsonian Institution. His more recent artwork has appeared as interior portfolios and on the covers of literary journals in America and abroad. McGowan is the subject of The McGowan Collection in the archives of the History Department of Memphis Public Library and Information Center, one of America’s premier public libraries. The collection contains hundreds of clippings and photographs, published and unpublished writing by and about McGowan, documentation of art works, several hours of news/television video segments and programs, and other materials. Robert McGowan and his National Emmy-winner wife Peggy live in the Cooper-Young neighborhood of midtown Memphis. "The underlying structure of these sometimes amusing, sometimes poignant stories—what motivates artists and how they think and what can happen in work or in life, intentionally or inadvertently . . . all of it feels absolutely true to me. And McGowan speaks of the art world in a deeply engaging and distinctive voice. " 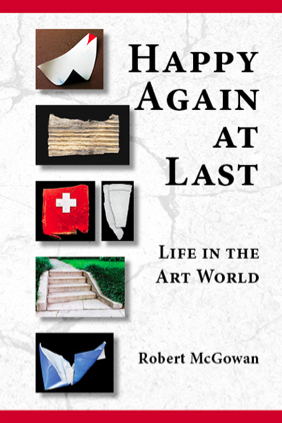 "In Happy Again at Last, Robert McGowan explores the lives and motivations of those who live with art. Like the characters who inhabit these stories, readers will discover where “. . . essential parts of themselves reside.” McGowan offers something of himself in this collection. As both artist and writer, he . . . knows that memory and desire change characters and charge situations. He takes the reader on a journey through the world of art and through the inner world of the heart as well." "With a nod and a wink to Cranbrook Academy of Art, where Robert McGowan’s first adventure as an artist found him working in clay, the seven stories that comprise The Cranberry Suite portion of this collection, Happy Again at Last: Life in the Art World, are vivid depictions of a close-knit art community, a camaraderie of the strange, where in the early 1970s an artist could “see what it was like to be whatever the hell she wanted to be.” But like the writer’s own ceramics that initially seduce us with their bold and confident forms, a close reading of the characters in these stories—with their colorful, “zingy,” and, at times, arresting quirks and details—rewards the reader with compelling and complex portraits of individuals who at their core are ultimately fragile souls trying to find their place in the world. McGowan is a masterful observer of the human condition and a precise and thoughtful artist and craftsman, whether working as a visual or a literary artist."